Generally when travelling to other regions and continents I often automatically compare the unknown with the familiar. As a result disparities are often my main impression, the obviousness of difference at first sight. However, when further reflecting about apparent differences many become less particular. Postcolonial theories highlight that constructing the seemingly different ‘other’ makes people overlook certain similarities. The process of ‘othering’ over-emphasizes superficial differences and as a consequence obscures power structures that, from an emancipative perspective, are important to uncover. Here I do not wish to explore the aesthetic resemblances between Haldia and Piraeus but the structural ones. There are similarities and differences between the structures of port logistics and economics in the two harbours concerning business models, governmental policies and conditions of workers. Of course comparing a space of the Indian periphery with the European centre can be problematic, particularly when comparing the obviously high level of exploitation and inequality in India with European conditions, which are not without their own struggles for labour. On the other hand, such comparisons can be useful in understanding the systemic particularities and general characteristics of the overall economic structure of capitalism. Warehouse, Haldia port, 2016. Photograph by Carolin Philipp. The publicly owned port of Haldia, 125 km from Kolkata, is not just a confined area but consists of the surrounding region where people live and make a living from the port. 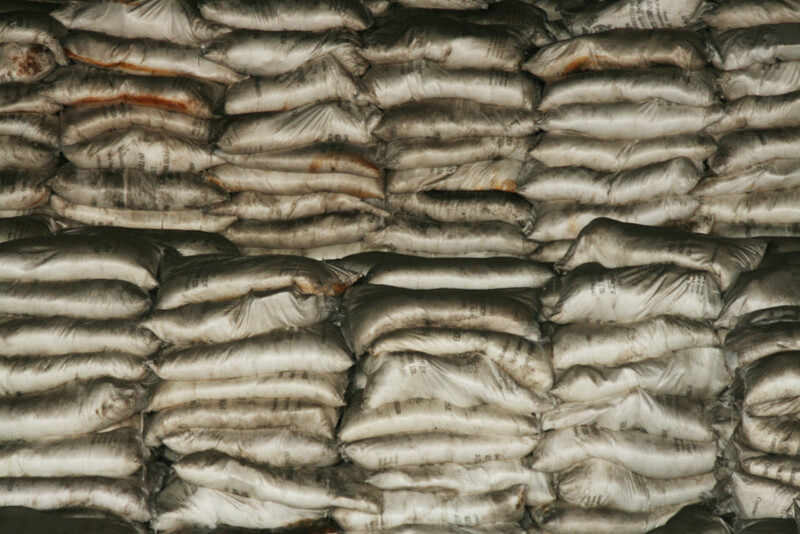 Businesses, industries and workers are dependent on the industry generated by the bulk cargoes arriving at this major river port. Most of the inhabitants of the region were formerly internal migrants from West-Bengal and other provinces. In the construction process of the dock complex, a large number of people were displaced. Some of them got a permanent job in the docks, while others are still struggling for compensation. The majority of the permanent work force is composed of people who were dispossessed of their land in the 1960s and have been compensated with employment at the docks. In the Greek harbour of Piraeus the structural conditions are different. The container piers have been privatized during the last decade. At the beginning of 2016 the remaining port infrastructure was sold as a concession to the same company that had purchased the piers, the Chinese state owned Cosco Pacific Ltd. Before the privatization process the business structures in the area were interconnected like a ‘string of pearls’ lined up along the Mediterranean shore starting at the Gulf of Elefsina, some 20 km from Athens. Steel factories, ship repair yards, scrap metal yards and the shipping on the various Piers all related and interacted with each other. The workers came from all over Greece, migrating to the capital city and its port. The Cosco Pacific Ltd. business model disrupted the fabric of local interconnectedness. The container piers are now predominantly used for trans-shipment that – immediately and without taxation – leaves the harbour after being reloaded on the subsequent ship. The Cosco Pacific Ltd. network is a connection between geographically remote, but highly connected zones of exception which are surrounded by societal and economic structures. The above observations demonstrate different systems of ownership and responsibility. 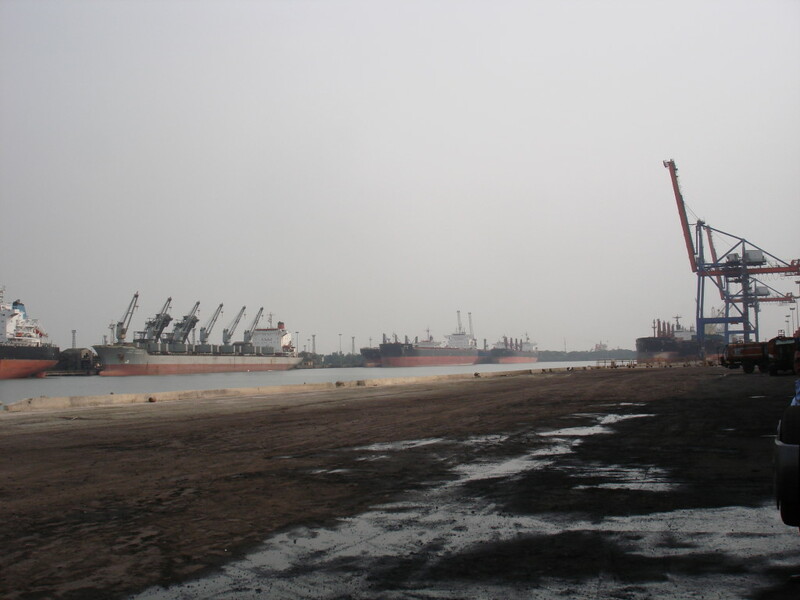 Haldia port facilities, like the 11 other major ports in India, are public property. In India the privatization of many businesses is prohibited by law. Nevertheless, some businesses are leased to private companies and this is the case in the electricity and mineral sectors. Also within the port system there is a growing tendency towards the development of public-private partnerships. The determination of what is private or public is made by the central government in Delhi as the ports fall under the aegis of that government. In Greece the deregulation process of public property is different. The port of Piraeus is at the point of being one of the biggest privatization projects prescribed to the country by the creditors of the ‘Troika’ of the International Monetary Fund, the European Central Bank and the EU-Commission. When, in the course of the Euro-Crisis, the Greek government had to apply for financial ‘aid’ from several international institutions, the Structural Adjustment Program (that until then had only been applied in the Global South) returned to its source in the Global North. In Greece strict austerity measures have been applied since 2010 and these were the hardest measures that any Western state has had to comply with in peace times (30 per cent cut to public salaries, 50 per cent cut to spending on commodities and services, 25 per cent reduction in social spending). The results of these measures, however, have not been as promised by the Troika institutions, and alternatively the economic performance of Greece has declined by 25 per cent, the average income by 25 per cent, and investment in enterprises by 70 per cent. Further, the high public indebtedness, which has been cited as one of the causes for the crisis, has increased from 120 per cent in 2010 to 180 per cent in 2014. So while in India the central government, in faraway Delhi, decides the policies and level of privatization in the port, complying with the global tendency towards privatization, in Greece the economic decisions have since 2010 been made in Washington and Brussels by lending organizations. In Haldia township, the idyllic image any visitor is presented with, a green village-like atmosphere where people stroll along the streets until late into the night, is eroded when talking to union representatives. While segments of the harbour labour force have been leased to private companies the individual workers have remained the same. They merely work for a different company but with, in most cases, different conditions. The division of workers into permanent and contracted positions has destroyed the established and secure working conditions of port workers. In Haldia an estimated 60 per cent of the 7000–8000 workers are casual, earning a fractional amount compared to permanent staff (12.000 versus 45.000 rupees per month). These workers are not allowed to access welfare and pensions are at risk when job security is poor. The permanent workers are also exposed to insecurity through expropriation and 80 per cent of workers have lost their land. Their compensation for losing the land that supported them – whether in the form of a permanent job or money – has been minimal and in fact has led to them being more dependent on the state. Within the context of high unemployment and people’s fear of losing their jobs, traditional labour structures have been eroded and people have become indifferent about things of import such as the environment and working in a way that reduces pollution. In Piraeus, where the deregulation process has involved complete privatization, Cosco Pacific Ltd. has created a whole new system of work relations. A new and smaller workforce has been hired by Cosco. Researchers for the EU-funded Daphne-project, BENEFIT, claim that ‘container port growth generates limited local economic value and employment’ and ‘significant concerns have been raised with regard to the local labour standards’. In order to reduce the terminal operation costs, working hours have been highly flexibilized, working shifts have increased to 16 hours and accidents were unrecorded until a strike in the summer of 2014 resulted in the founding of a union. Haldia docks, 2016. Photograph by Ned Rossiter. Given these observations it is clear that the feeling of familiarity I felt when seeing the cranes and containers in Haldia was only a superficial observation. Haldia port and its workers have a greater interconnectedness with their social and local economic surroundings compared with the port at Piraeus. This has resulted in different possibilities for the workers who play a more influential role in the processes of the port. Decisions about the logistical processes in the two ports also differ, particularly because in Haldia the Indian government exercises authority and influence. Last year the contracted dock workers joined in a general strike of the permanent workers and increased pressure on the national government. In Piraeus the Greek government, urged by the IMF and other EU institutions, this year completed the privatization process, which commenced in 2009, with the privatization of the container Terminal Pier II and with the signing of an agreement to privatize the whole port. Such privatization means that protests and resistance in Piraeus are directed at authorities that are more international and thus more remote from the actual port, which is distinct from the situation in India. So the precariousness and deterioration of working conditions resulting from a tendency towards privatization of port infrastructure and labour is, as far as I can see, a phenomena happening in the port and surrounds of Haldia as well as Piraeus. Whether governmental decisions in Haldia or private ones in Piraeus, such decisions are leading to a situation where workers must be more flexible and yet more exposed to job insecurity. So while workers face a similar situation in both countries they have to address them differently because of the different labour situations. * I would very much like to thank Samata Biswas who did research in Haldia docks and township and who provided me with some interesting insights for this essay.